CooksRecipes has quality, kitchen-tested recipes for chicken dishes, made with fruit, that you can count on for successful deliciousness. 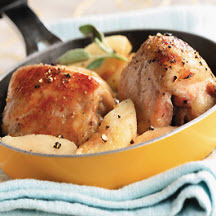 A simple skillet dish featuring economical chicken thighs quick-braised in a chunky apple sauce seasoned with honey, shallots and fresh sage. 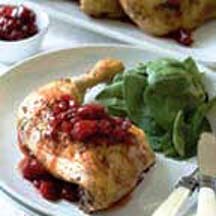 Whether you're planning a special holiday buffet or a casual dinner party, this delicious chicken dish, made with maraschino cherries and pomegranate juice, is sure to please. 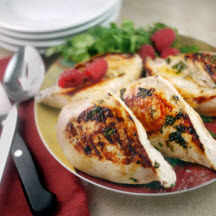 This easy recipe for pan-grilled chicken breasts starts with a fruit juice and soy sauce marinade.